Rheumatoid arthritis is a chronic (long-lasting) inflammatory disease that causes pain, stiffness, warmth, redness and swelling in joints. Over time, the affected joints may become misshapen, misaligned and damaged. Tissue lining the joint can become thick, and may wear away surrounding ligaments, cartilage and bone as it spreads. Rheumatoid arthritis usually occurs in a symmetrical pattern, meaning that if one knee or hand has it, the other usually does, too. 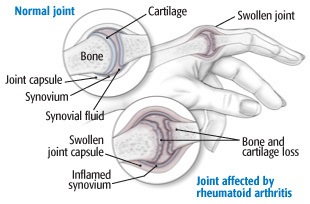 The cause of rheumatoid arthritis is unknown, although it appears to be an autoimmune disease. When the body's immune system does not operate as it should, white blood cells that normally attack bacteria or viruses attack healthy tissue instead — in this case, the synovium, or joint tissue. As the synovial membrane (the thin layer of cells lining the joint) becomes inflamed, enzymes are released. Over time, these enzymes and certain immune cells damage the cartilage, bone, tendons and ligaments near the joint.